"Possess incredible power and reach, but reduces max MP by 1. Rarely deals critical blows." Defeat Cloud in the Hercules Cup. "A special attack card that can break through physical defenses. A bit difficult to handle." 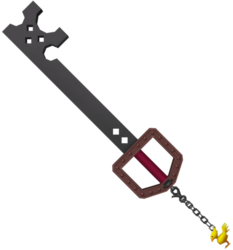 "A combo-mod Keyblade capable of crushing blows. Its powers assist those who seek supreme strength." Rare Prize Blox in the Layer 27. Slay 80 enemies with the Metal Chocobo. Slay 160 enemies with the Metal Chocobo. Slay 240 enemies with the Metal Chocobo. Slay 320 enemies with the Metal Chocobo. In Kingdom Hearts, the Metal Chocobo is a reward for defeating Cloud in the Hercules Cup. The blade resembles Cloud's metal Buster Sword, and the Keychain's token is a Chocobo. It possesses a red handle and guard. At the base of the blade, there are two holes, one on top of the other, and there are three holes adjacent to the teeth. Although the Metal Chocobo's name is directly derived from the Chocobo of Final Fantasy, the appellations of its upgrades in the Japanese version of Kingdom Hearts Re:coded are actually derived from those given to the various forms of Bahamut in the Compilation of Final Fantasy VII, in which Cloud is a major character. In contrast, the appellations in the English version play on the "Metal" portion of the name: Iron (Fe), Silver (Ag), Gold (Au), and Platinum (Pt). The Metal Chocobo appears as a 5★ Keyblade. It can be acquired from the Relic Draw during the Kingdom Hearts collaboration event. The Metal Chocobo bestows the Burst Soul Break Ars Arcanum when equipped to Sora. This page was last edited on 5 April 2019, at 15:15.